Aultmore Distillery was so nearly a casualty of the many disasters to hit the whisky in-dustry – a boom and bust cycle that counts the Pattison crash, Prohibition and the Great Depression, two world wars and the 1980s surplus. Thankfully Aultmore survived to become part of the Dewar’s White Label blend with the single malt sometimes dubbed the ‘rarest of Speyside’. Aultmore, meaning ‘big burn’ in Gaelic, was founded by Alexander Edward in 1896 (production com-menced 24th May 1897). Edward has been described as one of the most energetic men of his genera-tion and one of the most prolific whisky men of the 19th century. By the time he turned his attention to Aultmore, he had already helped establish Craigallachie in 1891. His family had a tradition of distilling in Banffshire, with Benrinnes having been under the control of his father since 1864 (and recently bequeathed to him just prior to his founding Aultmore). He chose the location for Aultmore in the heartlands of Speyside, along the banks of the Burn of Auchinderran, known as the Foggie Moss Burn, long an area renowned for its illicit stills. Remote and sparsely populated, it was a perfect haven for smugglers’ ‘bothies’ – or booty. At the time, Scotland was in the midst of the biggest whisky boom it had seen for years as Scotch filled a gap in the market left by cognac after the region’s vines had been decimated by Phylloxera. As soon as production started at Aultmore in 1897 its spirit was immediately in demand. Within a year production was doubled and Alexander Edward continued his enterprising streak, establishing Benromach distillery, Dallas Dhu distillery and taking control of Oban, as the head of the Oban & Aultmore-Glenlivet Co.
Much of Aultmore’s initial output was purchased by the resourceful Pattison brothers. Originally dairy farmers from Edinburgh, they had started blending whisky until 1896 when they launched their own brand of whisky under Pattison Ltd. As the brothers continued to achieve spectacular success, they acquired half the shares in Glenfarclas distillery and substantial interests in Oban and Aultmore distilleries. Investors and banks offered huge overdrafts to the brothers and whilst the boom continued the credit stretched on. 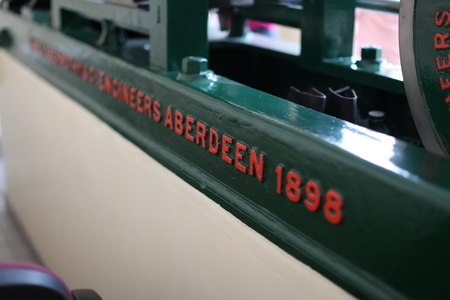 Aultmore underwent its first upgrade, turning from its waterwheel to a 10-horsepower steam engine which ran for 70 years (and can still be seen at the distillery). Some sources say that Aultmore was forced to shut its doors in 1899, just two years after it had begun production. While this is not the case, production was reduced between 1899 and 1903 when it fell under the patronage of Oban & Aultmore Glenlivet Distilleries Ltd. However, the resumption in full production proved short-lived with the outbreak of World War I forcing distilleries to halt production due to barley shortages. When it was once again able to reopen its doors in 1923, Alexander Edward had had enough and de-cided to sell to John Dewar & Sons for £20,000. This sale suggests that Aultmore may have already been an important part of the Dewar blends at this time. Just two short years after the purchase, Dewars, forced by stringent times (Prohibition was in full swing in America), merged with John Walker & Co., James Buchanan & Co. and the Distillers Company Limited, operating collectively under the latter’s name, though transferred to the subsidiary Scottish Malt Distillers in 1930. Aultmore continued under Scottish Malt Distillers’ stewardship for years, making incremental changes until the 1960s. The distillery has its own railway siding from the branch line which bought in coal to fuel the steam engine which powered the mill and pumps. Under the radical 1960s railway reforms of Dr Beeching which forced the mass closure of stations and miles of branch lines, Aultmore was forced to move from steam power to electricity in 1969, finally abandoning the engine that had worked there for 70 years. As part of this refurbishment the distillery was shut and completely rebuilt to the extent that nothing was left of the old buildings. However, two more stills were added, (taking their number to four) and doubling production capacity. 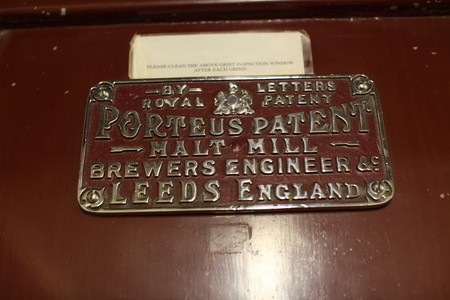 At this time the floor maltings were closed with malt sourced from third-party maltsters. Just after these changes Aultmore became one of the first distilleries to build a dark grains plant for processing pot ale and draff into cattle feed. This started working in 1977 but closed from 1985 until ‘89, and finally taken out of production in 1993. The hard times endured, with a surplus of whisky remaining on the market, and Aultmore survived relatively unscathed, but further change was afoot. In 1987 Guinness purchased Distillers Company Ltd and combined it with their existing company Arthur Bell & Sons to form United Distillers. A 12 year-old Aultmore single malt was released in 1991 as part of United’s Flora & Fauna range, and in 1996 a 21 year-old cask strength was released under the ‘Rare Malts’ brand. Change was then again visited upon Aultmore when, in 1997, United Distillers Group merged with its rival Grand Metropolitan to form what we know today as Diageo. The authorities deemed new company to hold too greater a monopoly on the whisky industry so Diageo was forced to sell some of its whisky distilleries and brands including Aultmore, Aberfeldy, Craigallechie and Royal Brackla distilleries as part of John Dewar and Son’s and the Dewar’s blend. Together with Bombay Sapphire Gin, the package of distilleries and brands was snatched up by Bacardi for a cool £1.15 billion. Aultmore has seen subtle changes since the takeover, including the 2002 installation of a larger, state-of-the-art Steinecker full lauter mash tun. The whisky is still used predominately as part of the Dewar blends, including White Label, the bestselling blended Scotch in the United States. However, in 2004 Barcardi released a 12 year old official Aultmore single malt bottling. This 12 year old bottling was updated in 2014 with a 21 and 25 year old bottlings also released (January 2014). •1896 – building works commenced on Aultmore Distillery which was established by Alexander Edward, a second generation whisky distiller who was expanding the business he inherited from his father. Edward had inherited Benrinnes Distillery at Aberlour, and he was one of the founders of Craigellachie Distillery. 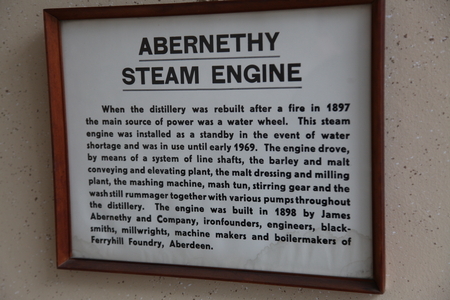 Aultmore Distillery was the first distillery he built from scratch. •According to legal records, Alexander Edward purchased land from the Duke of Fife in 1896, including farms of the Milltown of Tarrycroys and Nether Tarrycroys in the parish of Keith. He purchased a number of pieces of land from other sources too. •The land purchased was then sold to the Aultmore Distillery Company in 1896, which consisted of four partners – Robert Paterson Pattison and Walter Gilchrist Gray Pattison both wine and spirits merchants in Leith, Frederick William Brickmann, Spirit Broker at 46 Constitution St Leith and Alexander Edward of Craigellachie. •1896 - Alexander Edward also purchased the estate of Sanquhar near Forres. •In 1897 a legal agreement was signed for the creation of a Brewer’s House near the distillery. •1897 – On 24th May production at Aultmore began, and it was to be a first class Highland whisky. The first mash consisted of 320 bushels of malt, and for the week a total of 600 bushels (about 15 tonnes) were used. This produced 3,640 litres of alcohol. •The original wash still had a capacity of 5,045 gallons, and the spirit still had a capacity of 3,850 gallons. •1898 - The whisky was soon so popular that ‘extensive alterations and improvements’ were announced. This included additional malt barns, tun room accommodation and duty free warehouses. By July Aultmore’s capacity had doubled to 100,000 gallons a year. 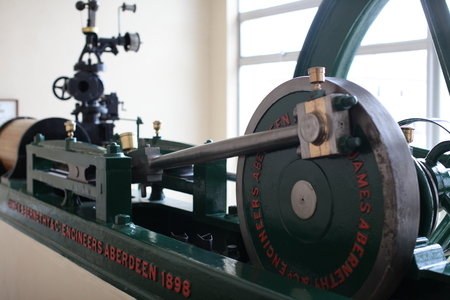 •An Abernethy steam engine of 10h.p. 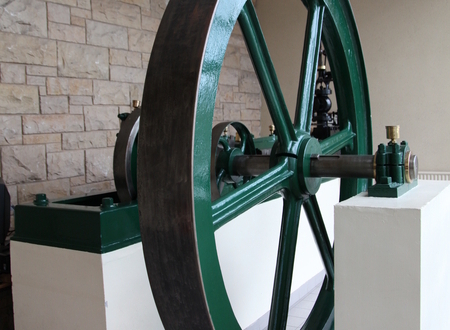 dated 1898 was installed round about this time to supplement the original source of power, a water-wheel driven by a lade from the distillery dam. All machinery in the plant was inter-connected to allow it to be powered by either the steam engine or the water-wheel. After the latter fell into disuse the steam engine worked the barley and malt conveying plant, the malt dresser and mill, the mashing machine, the wash still rummager and various pumps. 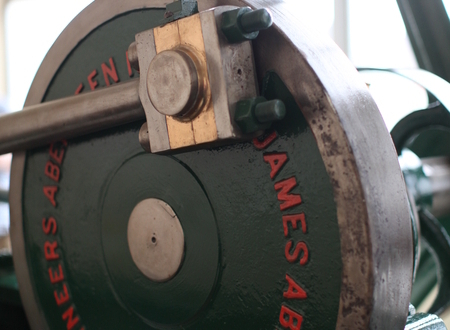 This piece of engineering excellence continued to give service for almost three quarters of a century and is preserved at the distillery today, although not in working order. •In 1898 the company was described as The Aultmore-Glenlivet Distillery Company in a legal document title, though within the actual legal agreement the word Glenlivet was not used. •1899 - the blending house Pattisons Ltd of Leith, who had an interest in the new business, collapsed. Pattison’s was one of the largest customers for Oban’s whisky, and its’ managing director was a partner in the Aultmore enterprise. This led to a series of business failures, including Brickmann’s (he went bankrupt in 1899), and affected the entire malt whisky distilling industry. Oban and Aultmore’s ouput had to be cut and the share capital reduced to £67,650. •By 1900 the market was overloaded with Speyside malts, and many distilleries operated only part-time. There were 161 distilleries in 1900. Aultmore made little progress until trade revived in 1903-4. •1907 – The annual meeting of the Oban and Aultmore-Glenlivet Distilleries Ltd took place at Aultmore Distillery. It noted a considerable increase in profits from the previous year. Edward also indicated his dissatisfaction with the current government who he felt were not making enough effort to combat the economic depression. •1915 - The railway line to Aultmore closed. •1917 – 1919 - All distilleries closed due to the first world war (1914-1918) and related government restrictions. Following the first world war there was an economic recession which seriously affected the industry. •1922 - 23 - Extra wash backs were added to the tunroom. •1923 - Oban & Aultmore put its two distilleries up for sale. Aultmore was bought by John Dewar & Sons Ltd for £20,000. The farm was included in the sale for a further £845, plus costs for the value of stock in trade. The deal included the distillery buildings, machinery, plant, tools, coal, cut peats, and with regard to the farm all livestock, crops, grass, turnips and even dung! •At the time of the liquidation in 1923 the Directors are listed as Alexander Edward, Robert Bertram Gillespie Grey, Thomas Lambert Brown and Woodville Foulis Harley. •1925 - Dewar’s amalgamated with Buchanan’s, Walker’s and the DCL. •1930 - Aultmore was transferred to DCL’s subsidiary, Scottish Malt Distillers Ltd. This is recorded in a legal land transaction document in which the distillery is sold for £14,231. •1943 - The distillery closed from 1943 – 45 to conserve barley supplies during the Second World War. •1947 – A fire at Aultmore Distillery is recorded in the local fire department archives on 7th September. No further information is available regarding how serious the situation was or what was damaged. •By the early 1950s Aultmore was distilling again. From 1952 experiments were carried out at Aultmore (and subsequently at Imperial Distillery) into pioneering environmentally friendly recycling of distillery effluent, and a new technique to produce a new type of dried high-fibre animal feed was successfully developed. •1962 - There were 34 employees at Aultmore Distillery. •In the late 1960s a programme of improvement and expansion began at Aultmore. •1967 - The two pot stills, previously heated by hand-fired furnaces, were converted to steam heating from a coal-fired boiler. In the same year the malt barns closed. •1968 - The distillery stopped making its own malt and started to draw it from one of SMDs regional maltings. At this time the long disused water wheel was demolished. The distillery had 27 employees at this time. •1969 - The steam engine went into retirement. •1970 - The distillery was closed from January 1970 to February 1971 when two additional stills were installed and the boiler was converted from coal-burning to oil-firing. •1972 - A new effluent recovery plant was built to make distillers’ dark grains. This is a mixture of draff and syrup obtained from evaporating the pot-ale. •By the 1970s there were 15 houses at Aultmore owned by SMD for distillery employees. The distillery property at that time included a farm of 130 acres, Milltown of Tarrycroys, the main products of which were cereals and beef cattle. The distillery at this time was licensed to John and Robert Harvey & co Ltd of Glasgow, blenders of Harvey’s Gold label and Harvey’s Special Scotch whiskies. They also bottled and sold Aultmore as a single malt. •1981 - A number of distilleries closed during the summer for 2 months (in addition to the silent season) in order to cut back on production. This included Aultmore. This was the result of decreasing whisky sales and the world recession which had lead to a build up of whisky stocks in bond. •1985 – Aultmore’s dark grains plant closed down. •1989 – The dark grains plant re-opened until 1993. •1996 – The warehouses were demolished, and all spirit was removed by tanker for centralized maturation. Aultmore had 12 employees at this time. 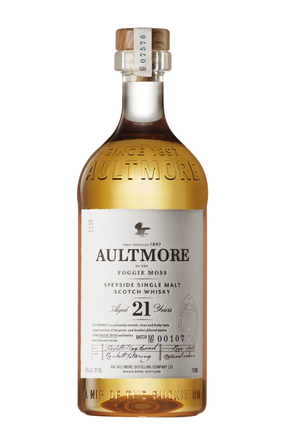 •In 1997 Aultmore celebrated 100 years of production. The celebrations were marked by a tree-planting on the Aultmore grounds. A centenary dinner dance was held in the Seafield Arms Hotel, Keith. A limited edition bottling of 16 year old Aultmore was created to celebrate the centenary, and the rear label was printed with all of the names of the distillery staff in 1997. •In the same year a new gas boiler was installed. Production at this time was 1.522 million litres of alcohol, produced over 42 weeks. •1998 – The site occupied 19 acres (8 hectares) with an adjoining farm of Milltown of Tarrycroys (130 acres / 53 hectares). Approximately half of this is planted with trees, the remainder being grass which is let to local farmers on an annual basis. •1999 – The redundant Dark Grains Plant and Cooperage were demolished. In the same year a new cooling tower was installed. •2001 - 14.87 hectares of ground were planted out in Conifer and broadleaved trees. In total 135,000 trees were planted in ground belonging to Aultmore Distillery. •2002 – A lot of work was carried out in order to up-date the distillery. A new mash house was built, and the old mash tun from the 1960s / 1970s was replaced with a new lauter tun. The old mill was retained, but other parts of the milling system were added or replaced. A C.I. P. system was also added, along with a new stainless steel refrigerated yeast system to keep the yeast chilled. The draff tank was also replaced. •By 2010 output was at 3.03 million litres of alcohol. Water from the Auchinderran Dam was used for the production process. Any overflow would go into Tarrycroys dam. Ryeriggs was used for cooling water and Tarrycroys dam was used for cooling if more were needed. 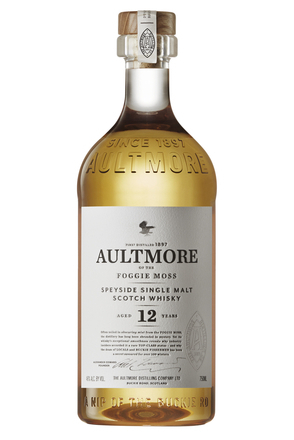 Released in September 2015, Aultmore 18 Year Old is bottled without chill-filtration or the addition of caramel colouring. Released in January 2014 as part of Dewar's ‘The Last Great Malts range’.